My financial goals change at least once a year. While that might seem like a lot, it’s not necessarily a bad thing. I’m in a different spot now than I was a year ago and it would be silly for me to keep saving money for something that no longer appeals to me. Since I don’t have any debt all of my goals have to do with saving money. A little less than a year ago I set a goal to save for an investment property. After setting that goal I started redirecting all of my extra money to an earmarked savings account. Now, I’ve changed my mind. I want to save a large down payment for a house of my own. And you know what? I might change my mind again but either way I’ll still be stashing away the money. I am pretty certain that buying a house and some land is going to stay on my long term goal list. 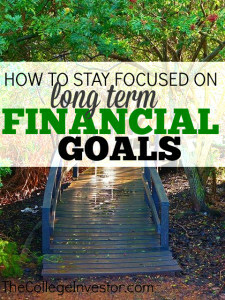 As an avid goal setter I know how easy it can be to lose focus on those long term financial goals. So today I wanted to share three things that help me stay focused. I created a goals binder several months ago for my online business and I love it! All I have to do is open up the binder to review my long and short term goals, see what I need to do, and stay inspired. I have my binder broken down into sections – the “why” of the goal, the actual goal, an action plan, what I’ve accomplished, and of course, inspiration! Having all of my thoughts on the subject in one place is great. Another thing I do is name my savings account after my goals. Being able to look at those individual accounts and see where each stands is extremely motivating. If you’re trying to save a large amount of money or pay off a large amount of debt, the big picture feels so far away. When you check your bank account and see that you only have $2,000 out of the $40,000 you need it be can be a bit…….well, disheartening. A way to overcome this is to set quarterly goals. While you should definitely know what you’re shooting for it makes more sense to set and achieve those three month financial goals than it does to look two years out. By setting these smaller goals you’ll always feel like you’re-almost-there – making you want to push forward. When You Fall Off Track…….. When you fall off track just hop back on. Nobody is perfect. Everyone falls of track sometimes. However, the thing that separates those who achieve from those who fail is the ability to recognize their mistakes and get back to the plan. 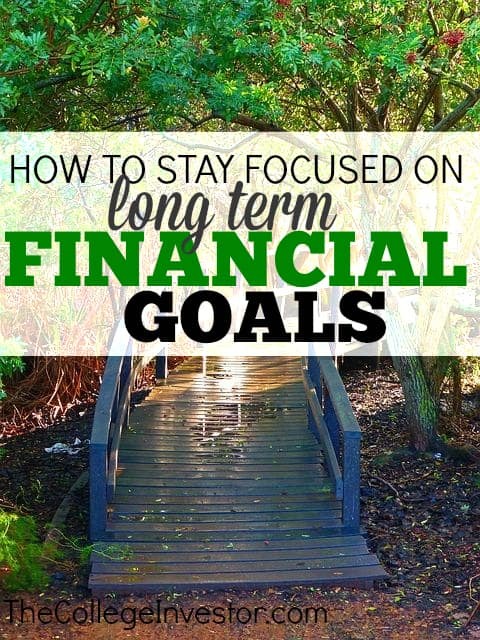 How do you stay focused on your long term financial goals? I have 3 levels of goals. At the very top, I have my ultimate retirement goals. Then, I personally set myself annual goals in all areas of my life. From these annual goals, I also have monthly goals. Most will simply be a pro-rated version of my annual goal, but all will be linked in some way to these annual goals. This is the basis of our 2015 savings challenge which we launched yesterday and hope that many people will come along with us on our journey to financial freedom. Come take a look – it would be awesome to have you involved! Prioritizing your goals is very important, as you may end up not having the time or energy or resources to hit every goal. If that happens, instead of getting flustered and getting nothing done, you can immediately focus on the goal or goals that are at the top of the list, giving you the best overall success factor. If you were to break your quarterly goals down into monthly goals, it would be even better for you to track your progress and to stay more motivated. I have created the DUMB SMART system to break a big goals down into smaller manageable goals. Big hairy goal: you want to earn/save 20 000 $ more in 2015 (than the year before). You could then break the activities down into each week, and even better, set specific day and time slots for each activity. Example of activity 1 – you have calculated that you need to perform 4 billable hours per week to hit X amount of dollars per week. The more specific you can make it, the easier it is for you. In addition, by being able to constantly measure your activity vs. results, it will give you an indication if you need to step up your activity, or if you should consider lowering your weekly target. This would result in that you need to get the remaining money elsewhere, or that perhaps you should lower your goal. Success and reaching your goals, are all about strategic activities done consistently towards your ultimate goal. How do you eat an elephant? One bite at a time. Small and achievable goals are how I stay on track. I fall off the wagon every now and then, but hey, I am human.